This digital collection includes more than 2,100 of the approximately 6,700 images in the Pusey & Jones Photograph Collection. Pusey and Jones specialized in ship and machine building. Pusey and Jones Company's main facility was located in Wilmington, Delaware on the Christina River. The collection has not been digitized in its entirety. For a detailed description of the entire collection, click here to view the catalog record. Image: Cape Diamond built for U.S. Maritime Commission, 1943. Click to view. The tugboat, General Padilla, Hull 140, built for T. Amsink & Co.
It’s World Book and Copyright Day; may all your reading chairs be comfy, and all your rooms delightfully air cooled. 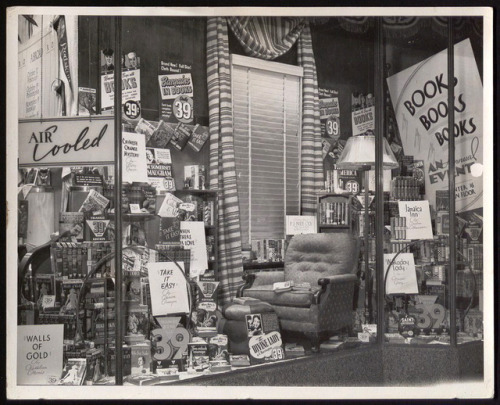 This 1933 photograph taken in Washington, D.C. is part of the Hagley Library’s collection of G. C. Murphy Company store windows and interior photographs (Accession 1995.247). You can view more items from this collection now by visiting its page in our Digital Archives.